User Experience (Not Technology) Is The Secret To Apple’s Success. Innovation is defined as “the introduction of something new” and when most people think of Apple they think of an innovative technology company. However, I would argue that Apple is really known more for designing innovative user experiences than it is for developing innovative new technologies. In other words, when it comes to taking technologies and changing the way people experience those technologies, no one is better than Apple. 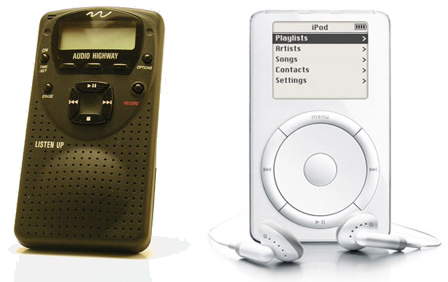 How many portable media players were there before the iPod? Make it easy for people to load music files onto the player. Make it easy for people to quickly browse through a huge library of music. Audio Highway’s “Listen Up” released in 1996. Apple’s iPod released 5 years later in 2001. How many smartphones were there before the iPhone? Make it easy for people to navigate emails and web pages in a way that is more conducive to a small handheld device (touchscreen gestures Vs using buttons or a stylus). Make the camera easy to use and share photos with others. 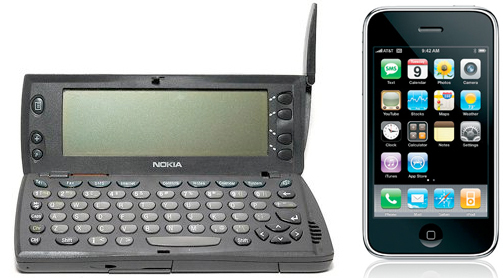 The Nokia 9000 released in 1996. Apple’s iPhone released 11 years later in 2007. How many tablets were attempted before the iPad? Apple wasn’t in the business of making tablets before launching the iPhone in 2007. Now it dominates the market. They didn’t invent the technology used to make a tablet—they made the experience of using a tablet better than any tablet that was made before it. Microsoft Tablet PC released in 2001. Apple’s iPad released 9 years later in 2010. In the video clip below, we learn that, ironically, Apple had the iPad before they had the iPhone but Steve felt the user experience methods designed for the tablet would be perfect for a phone.